Here’s a question that came up lately on a teaching forum, a question more and more people will be asking as time passes and the industry becomes bigger. Does anyone teach in a town or city with a way more advanced hooper than you? I’m feeling a lot of insecurity about developing my hoop classes because I feel like she could just walk in one day and do her thing and take it all away! Am I crazy? First off, You’re not crazy at all!! It both makes sense to feel insecure and also, it makes sense to think that despite that insecurity you too can make a living teaching. For example, I’m a hoop instructor yet I’m based in the San Francisco Bay Area where people like Spiral, Shredder, Revolva and other amazing, internationally recognized hoopers are. Even Nicole Wong of Cherry Hoops, who may not be internationally known but sure has a lot of fame here in the Bay Area and who took a hoop class with me early on in her hooping career as a student, is a far better hooper than I am — truly a student becomes the master sort of thing. On my best day I can’t do a fraction of what they do. But — and this is a big and very important but — that in no way means I can’t teach what I know and teach it well. In fact, when I started Temple of Poi, I can recall someone who had been teaching and facilitating spin jams here in the Bay Area literally laughing in my face saying other people had tried to start a school and no one else could do it before me so what made me think I could do it where they couldn’t? The number one answer is that I treated it like a business where other’s may not have. That’s an important consideration when you decide to run a school – one that can literally make all the difference. Here are 9 other things to consider when starting work as a flow arts instructor and competing with the big names that may already be established in your area. Just because someone is a great artist doesn’t make them a great teacher. This is a huge distinction which I at one point thought was worthy of this article: Teachers & Technicians: They Use Different Skills. 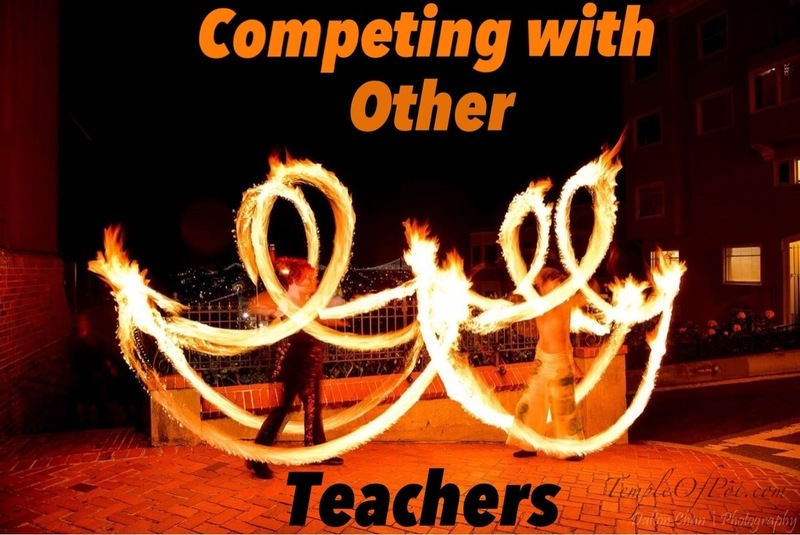 When you teach, you’re teaching from your competence, so only sell what you teach without comparison to anyone else. This may limit what you sell at first, but remember, what you do day one is certainly not what you’ll be capable of in year 3, 5, 10 and beyond. Just as the industry grows, if you yourself are growing as an artist and instructor, so will what you offer. Start with what you know an expand beyond that as you can. Most client’s aren’t just coming to classes with me because of the education. There is an element of community and experience that is a really important part of the whole class, especially now in 2014 when there’s so much free information on the web. If you create a compelling experience, people will want to be with you and enjoy your sessions because it is not just education: it’s an educational experience. Distinguish your brand by creating a unique experience that shows off your strengths and creates a compelling and inviting opportunity for the particpants. Never underestimate brand loyalty. People want to be right and they want to know they weren’t being fools signing up with one instructor vs. another so they will want to know that working with you was a good choice for them. Continue to add value to their lives both in and outside the classroom and people will get you’re invested and will be more loyal to you through action (class signups) and conversation (referrals). You can always develop a partnership. For example, here in the bay, Aileen Lawlor, one of the best contact staff artists I’ve ever seen, teaches staff. That doesn’t mean that other’s won’t come to me for lessons — which, if you’ve ever seen me staff next to her might be laughable from a performance persepctive. However, I can teach the foundational material and then when the client gets to a place where I have nothing more to teach, I can forward them to Aileen for deeper studies. This has worked particularly well because she travels a lot where we have a fixed location and it allows us to get people in the practice when she’s too busy working in other cities and countries. There’s nothing wrong with specializing in beginner material. In my experience, that’s where more money lies anyway. Not everyone goes past beginner level practice and, as they progress, they often find additional resources, want more variety and more so, have an independent practice. As a result, while they may want to come to an instructor in the beginning to get a good foundation, if you’ve done your job well, they may be more inclined to study off the internet or on their own after some amount of beginner studies. To some extent, that is actually desirable because it means you have empowered your student to teach them-self rather than being dependent on you — the sign of effective education. It’s highly effective when you differentiate what you’re offering in some way to draw clients in to your facility. For example, we have over 40 different poi courses here at Temple of Poi and I am unaware of anyone in the Bay Area — the world for that matter — who offers such a broad range of material on a year found basis. I’m also unaware of anyone who teaches introduction to fire hooping here in the Bay so we have an offering that is different than what other hoop instructors offer, which makes us sort of the “go to” for fire beginners who want a class nearby. Convenience is a factor! Some students study with me because my studio is closer to them or their work than anyone else’s and that is actually a factor for people, something you might not think about if you’re not the client. The flow trend is growing, not shrinking. Best as I can tell, we’ve got more and more and more people picking up flow arts and wanting to do it. I firmly believe there is more than enough business opportunity for all of us to thrive. If yoga studios can be on every block, I don’t see any reason we can’t have the same thing and currently, we are no where near that level of availability.